The Interstate 81 (I-81) corridor is Central New York’s and Metropolitan Syracuse’s primary north-south travel and commuter route. 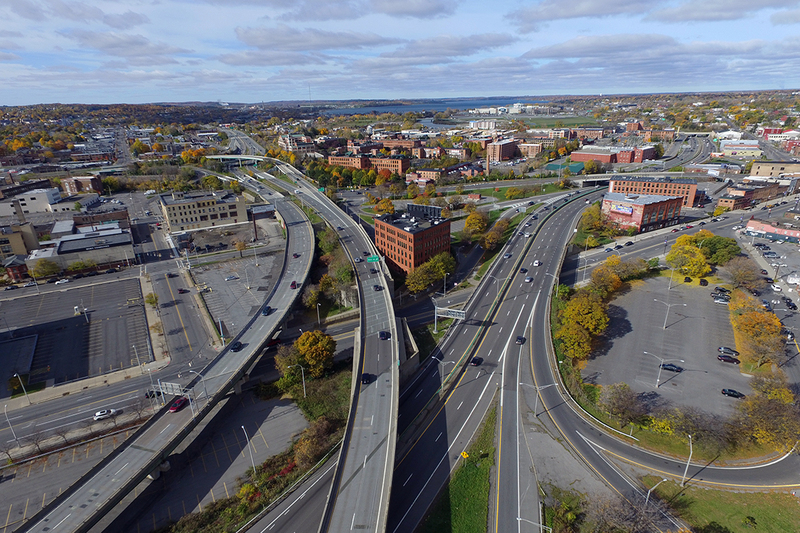 Built in the 1950s and 1960s primarily as an elevated viaduct through downtown Syracuse, I-81 needs upgrading as it reaches the end of its design life. The I-81 Viaduct Opportunities Project is developing and evaluating feasible alternatives. Working with a diverse team of design professionals and NYSDOT, headed by lead consultant Parsons, TWMLA plays a key role on the design team developing the Draft Environmental Impact Assessment (DEIS). TWMLA is partnered with the project team developing the project’s DEIS. We are providing description and evaluation of the project’s pedestrian and bicycle facilities, connectivity, streetscape character, and potential project gateway treatments for each alternative. To provide visualizations for the project’s Visual Impact Assessment, TWMLA collaborated with the consultant team to create highly accurate modelling of the designs. Utilizing a variety of modelling packages, TWMLA assembles and renders key project components and places them in their existing context. These images form the basis for evaluating the visual impacts of the alternatives.